Having battled PMS (Parked Motorcycle Syndrome) for months, I finally broke out for EWT (Extreme Wind Therapy) last week. This has been a very long winter in Nebraska. When the forecast called for 2 days in a row with temps in the 70’s, I had to act. I called in sick for 2 days in advance. (cough, cough), arranged for emergency feedings for my kittens and made a motel reservation in North Platte, 220 miles away. I got onto Interstate 80 easily and navigated urban traffic until the sign said I could open it up a bit. Speed limit is 75. To those who travel through our wonderful Cornhusker state, our friendly local Nebraska State Troopers will nail you hard if you do 80 or faster. Every other state in which I’ve ever driven will leave you alone at 8 over the limit, but don’t even think about that in our fair land. Word to the wise. But, I digress. I ran up to 78 mph, checked speed according to GPS to verify accuracy of speedometer and it was right on. Either that, or both devices are in error. I set the cruise control and waved at the Sheriff vehicle parked in the median. They let me go with a head start to the county line. This was going to be a wonderful day. Traffic was fairly light for this stretch of road and most of the drivers were courteous and careful. I love that when on two wheels. A woman traveling alone must always be cautious and alert. An old lady must be even more so, as they present an easy target. A great many women bikers relate great insecurity to travel solo on a bike. After all, you can’t exactly roll up the windows and lock the doors when feeling threatened. After many miles riding alone, I can say that I have great confidence in my personal safety. 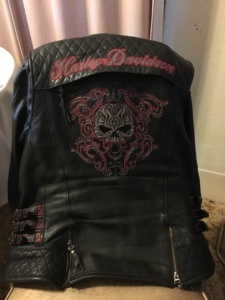 There appears to be considerable respect for anyone riding in full leathers on a Harley. I don’t know if others think this person might be armed or 300 of their closest friends are just over the next hill or what. I’m always treated with kindness and dignity by others, either in person or other vehicles. Back to riding. The medians and ditches are just starting to turn green. The fields are barren, with only a few short stalks left from last year. The popularity of “no-till” farming has reduced airborne dust a lot. Quite a few farmers could be seen in tractors tending to their fields. This is an exciting time here in farmland. As I approached Grand Island, 90 miles due west, I began to see Sandhill Cranes in the fields. They migrate from Central America, Mexico and even Florida on their way to their summer condos near the Arctic circle. They stop here along the Platte river to rest up and feed for several weeks before resuming their flights. This has gone on for thousands of years and it’s exciting to view these magnificent birds. I turned off the Interstate and headed north through Grand Island. I stopped for gas so I’d have enough to complete my day’s ride. I was headed into some pretty lonesome territory from here. I got on to U.S. Highway 2, the Sandhills Scenic Byway. This was native Nebraska prairie country. It is breathtakingly beautiful. I love riding out here. 13 miles down the road was Cairo, Nebraska. One of the great joys of open road bike riding is the fine dining opportunities afforded by small town bars. Small towns seldom have cafes or diners, but almost all of them have a bar. Dinner time in small town bars finds families gathered and often kids are present. This is the town gathering place. 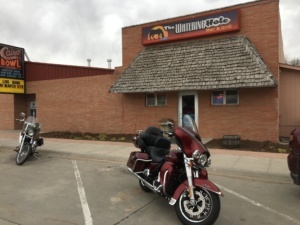 I rolled up to “The Watering Hole” bar, which is featured on www.beckysbikerblog.com as one of “Becky’s Best Biker Bars and Cafes”. Their burgers are delightful. Today’s special was Prime Rib Sandwich for $8.95. Are you kidding me? You’re lucky to get a bad burger and fries at a fast food place for that. This was real meat, unprocessed, from a real cow. The great taste told me that the grill marks weren’t just painted on, they came off a real grill. It was great and so were the fries. 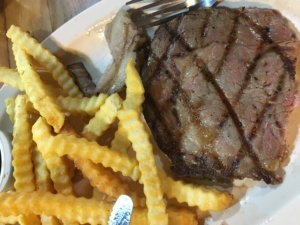 I don’t eat many fries, but the prime rib was consumed in it’s entirety. It was so good. This is the way travel was meant to be. I made conversation with the bartender, who is the proud owner of the other bike in the photo. He had just purchased it and said it needed a lot of work. He was extremely happy to own it and was learning to ride. I gave him 2 important riding tips and got back on the road. I decided to take State Highway 11 straight south out of town to get back on the Interstate. I need to get to North Platte for a visit with friends. The highway was classic rural Nebraska flatland. The road was nice and straight and flat as it could be. This was the Platte river valley. Every spring, the snow melt from the Rocky Mountains causes the Platte river to flood and over millions of years, a wide, flat valley has developed. I could see 2 State Patrol Cars parked off to the side of the road and several State Troopers were giving the car in front of me a real going over. They were inspecting the car and checking lights. Oh, my. My dream of being totally alone in the Universe was shattered by 2 State Troopers manning a “License and Registration Inspection” sign. They had 2 Trooper cars and were working over a sedan in front of me. I pulled up a respectable distance behind the car getting the attention, put down the kickstand, turned off the engine and removed my gloves. I was approached by a Trooper, who was so big he blotted out the sun. Staying seated, I held up open palms and said “If you don’t shoot, I won’t either” with a smile. He laughed loudly and said it’s a deal. I always treat law enforcement with complete respect and never question their actions or motives. I would never do what they do. Their job is to protect me and I want them to know that I appreciate them. He looked over my bike and said, “I’m pretty sure you’ve got this thing insured, so all we need to see is your driver’s license”. My fear of a complete search involving disassembly of the bike dissipated. I got my license out of my pocket. It’s in a little case with a few credit cards and some spare cash. I held it out for him to see. I’ve never had this happen, but he simply looked at it from a slight distance, he never reached out for it. He said I was good to go and told me to ride safely. I replied that I would and told him again of my respect for him and the job they do. Well, that was fun. I motored on, trying to figure out what it was that they really were doing in the middle of nowhere unless they felt the need to just goof off for a little while and take a break from trying to bust drug runners on nearby Interstate 80. Maybe that was their true mission, to check for those running the backroads. If you’re going to run drugs on I-80, watch the speed limit, signal your lane changes, don’t follow too closely and consider getting a job with far less risk, like selling shoes or something. So, back on the Interstate, I’m right in the middle of Sandhill Crane country during rush season. Every spring and fall, thousands of cranes stop over at the Platte river between Grand Island and Kearney to rest up for a few weeks. The river has wide and flat and has many sand bars. The cranes can get the protection from predators (think Wile E. Coyote) by gathering overnight on the sand bars. They make a super loud racket each morning and night as they leave and return to the safety of the river. Each day, they graze on the fugitive seeds that escaped the fall harvest, mostly corn, millet and soybeans. The cranes come from Mexico, Central America and Florida. After resting up here, they fly on to the far north, near the Arctic Circle. The journey has been going on for thousands of years, maybe longer. Being on an open road motorcycle enables one to ride under flying cranes and see things that are invisible to those in cars and trucks. Positively awe inspiring. Much of my younger life involved deadlines and rush trips and a focus on minimizing stops to shorten travel time or lengthen the distance traveled in a given time. I pulled into drive-thrus that were close to gas stops and ate while driving. Traveling by open rode bike for me now involves no particular time lines and often no particular destinations. I can just cruise along and see things that I’d never noticed before. How something as noisy as a big Harley Davidson can be considered peaceful and tranquil requires tossing a leg over one and heading out on the highway. All too soon I arrive at my destination for this evening, North Platte, Nebraska. I’d ridden 240 miles and was here to visit some dear friends from long ago in my life. The visit was heartwarming and over too soon. I returned to the hotel and prepared for tomorrow’s adventure. I filled up with gas and headed out. North Platte, Nebraska is pretty remote, but not nearly as remote as my next destination, Imperial, Nebraska. Its 91 miles south and a little west. I rode west on I-80 for 30 miles, then turned south. The weather was clear and sunny with very light winds. Perfect for riding. This was true country, with not a sign of city life anywhere. 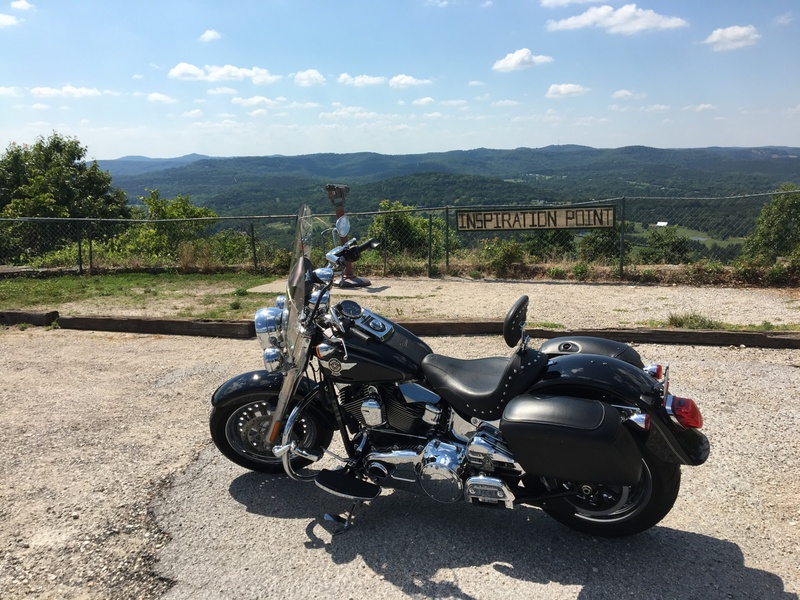 The steady drone of the Harley engine told me the bike was enjoying this trip as much as I. I thanked engineering for adding a cruise control unit that worked instantly and flawlessly. There was no lag time when engaged and it seldom deviated one mile per hour, even up or down steep hills. The raw torque of this monster engine was quite capable of holding any speed you wished, under any conditions. There were some wide, sweeping curves that make motorcyclists smile. It’s fun to lean a bike in curves and have it lift itself back up on completion, like some kind of magic. Highway curves cause beginner bikers to get apprehensive on approach to the curve. It’s normal to tense up and see the curve thinking you’re going too fast to make it. This is further complicated by a phenomenon known as “target fixation”, where you stare at a fixed object. The bike will go where you look, so if you fix your gaze on something, such as a place in the ditch, guard rail or a tree, you’ll drive right off the road into that spot. It takes experience to learn exactly where to look. Speed makes it vary, but once you figure it out, riding curves is easier. However, like learning to ride a unicycle, it’s simpler to talk about it than to do it. It seems like the ideal distance on which to focus your vision is about 2 seconds ahead of you. This is the same distance that’s considered to be safe following distance. The next problem is road surface. You can’t always see the pavement around a curve and often it contains surprises. Cracks in the road that have been sealed by hot tar can be slicker than the pavement. If the cracks are at right angles, no problem. However, cracks that run parallel to traffic can put a bike down quickly. Those are referred to as “tar snakes”. It’s important to steer around those for obvious reasons. An even worse situation is what I call the “Oregon Trail effect”, in which traffic has worn two ruts in the pavement and the center and far edges of the lane are raised. If you enter the curve in the center of the lane, you might find yourself just to the left of center, where it’s downhill. Tires don’t grip there. It’s important to use the positive banking of the Oregon Trail effect to your advantage. This is not often easy, as the pavement is not uniformly shaped. For riders to develop these skills, it’s important to learn to ride a line. There is the left line in a lane, the right line and the center line. Riding a line means you can keep your cycle within a few inches of the road curve as you travel. If you’re alone, it’s always best to take the far right side of a curve in order to protect yourself from unseen oncoming traffic. They just might drift over to your side of the road. Taking the far right means you don’t need the space they want to hog from you should they drift across the center line. Riding good lines lets you use the banking in your lane on Oregon Trail roads like a race track. The banked corners become your friends, rather than a treacherous condition. As you ride with other bikers, start paying attention to how they ride their lines. I first noticed this on the curves in the Black Hills at the Sturgis motorcycle rally. I’d learned how to do it on the Women’s Freedom Ride. This gives you a clue as to the abilities of others, which is crucial to your own safety. But, I digress. Back to the back roads in far southwest Nebraska. The road wound back and forth, over dams and around reservoirs, uphill and down. The wind was light, the sun warm and it was a glorious day to be on a bike. Traffic was very light and the drivers watchful and courteous. Folks out here are good people and if you have trouble, most will stop to help if they can. Feeling safe and secure is easy here. I had to make several road changes in order to get to Imperial and it was somewhat of a challenge to remember exactly where to turn. It was interesting to ride through small towns along the way. I always followed Dad’s advice on small towns—don’t you DARE speed in a small town. First off, it’s a safety hazard, but there’s always the chance you’ll encounter a speed trap. When Sheriff Taylor’s brother-in-law is the Judge is a worst nightmare and one which I seek to avoid. So, I’m enjoying the ride, hugging the curves, smelling the smells and seeing all the sights. Oh, was that my turn back there? Ah, yes, I believe it was. Phooey! I just passed it and now I have to turn around. One thing I just refuse to do is to come to a complete stop on a highway in order to execute a turn on a motorcycle that involves stopping and backing up. So, I have to look for a wide spot in the road. After a few miles, I find one and get turned back to find my route once again. That done, I’m now on a new road. The land now is flat as a pancake for as far as the eye can see. This is the high plains and it’s lovely. It’s amazing to see how straight the farmers can plow a field. They now use satellite navigation for GPS to keep the tractor pulling exactly straight. When looking down the furrows as you travel, the fields are plowed with military precision. Far too many people will say that this flat land is boring and deprived of any beauty. I’ll reply that they just aren’t looking. I pass a male ringneck pheasant, one of the most beautiful birds in North America. Wow, just wow is all I can say. My Dad used to hunt them and I remember eating pheasant as a little girl. I recall that there was no white meat on them, as white meat was muscle seldom used on a chicken. Pheasants can fly for real, so all their muscles are well toned. Now, back to the bike. I rode through some small towns and made my final turn to reach Imperial. The land was beautiful, flat and the soil very rich, as it was all in use producing crops. I made the turn off the highway into the town. I rode along a few blocks and turned off onto the road where my friends live. Life in a small town is all about peace and quiet. There are times when it is dead still and no sounds can be heard. Yeah, well too bad when a biker chick rides into town. The deep throaty roar of the Harley shattered the silence. I didn’t need to ring the doorbell, they heard me coming. I missed the house on the first pass, I had to make a U-turn and come by again. I love this. I met my friends, Leonard and Julie. We had a great visit and I got to eat some cookies Julie had baked that went well with her specially brewed coffee. They admired my heavy leather coat. I’ll say one thing for Harley Davidson. Everything they make is first class and engineered for riding and doing it safely. My jacket weighs a ton when lifted. The two photos show the jacket as it appears normally and then what it looks like when lights shine on it. I learned this in motorcycle class as a means to select clothing for being seen easily at night. Take a normal photo, then turn on the flash and take another photo. You can easily see the difference. Very good information. The jacket will make me visible and protect me well in the event of a slide on pavement. 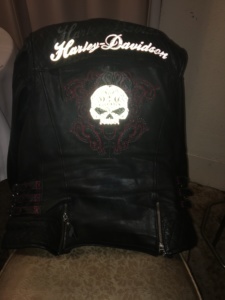 I have severe allergies to asphalt and concrete, so I always wear protective leather jackets when riding. We say our goodbyes and I don all my safety gear and fire up the bike. Love that sound. This is the fun part of any trip that I love the most. I have no idea where I’m going next. I know I need to be heading home, but the route that I travel is not planned, nor has it been studied. I thought that perhaps I could head south into Kansas and visit Atwood, where my mother grew up and claimed as her hometown. Since this is really the middle of nowhere, I think it might be wise to first get some gasoline. My range is about 160 miles and I’ve already ridden 90 miles. I find a nice station on the edge of town, but they have regular 86 octane and my high compression hot rod only wants premium 91 octane. I swallow and head out of town. This is the meaning of adventure and confidence. The map tells me there’s another town down the road. The bike can use regular if necessary, but so far, it’s not absolutely necessary. I enjoy music when I travel and in this part of the country, even the hog report sounds good on the radio. 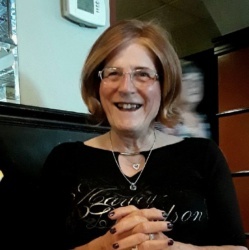 You might find a station that invites you to attend the middle school recital this Friday, then gives a shout out to Hilda, who’s celebrating a birthday today. Fortunately, I’ve planned for this situation. I’ve got 465 of my favorite songs for riding programmed into my phone and my bike has blue tooth capability, so I switch over to “Becky’s Phone” for entertainment while I ride. For many of us, music becomes part of our lives. As we hear old songs, we are taken back to experiences in our lives that correspond with certain tunes. I’ve been a widow now for 2 years, so my mission in life is to not only look forward to new experiences, but also to re-program my brain for new pleasures in life. I’ve succeeded in programming a few songs now to motorcycle memories when I hear those tunes. Gradually, over time, I’ll relate music to pleasures experienced on my bike. I like that and it’s been a tremendous help to me. I crank up the tunes, twist the throttle and it’s one down and five up (that’s the shift pattern for the bike). From neutral, you first push the shift lever down with your foot for first gear. The rest of the gears involve lifting the lever with your foot. We’re cruising now. The road is straight, the sun is out and the temperature is nearly ideal for biking. I’m in gently rolling hills and the vegetation is becoming more sparse on the high plains. The speed limit is 60 and I’m riding the maximum safe speed of 68. My experience is that law enforcement will generally leave you alone if you’re less than 10 mph over the speed limit, unless you’re on I80 in Nebraska, then it’s 5 mph and you WILL get stopped if you’re over that. At any rate, at 68 mph and very little traffic, the bike does fairly well on gas. This is a good thing. I’m starting to run short of time and realizing that a trip to Atwood just isn’t in the cards for today. Next town is coming up, maybe I can get gas. Here it is, Benkelman, Nebraska, the last town before the state line. There’s a gas station right here, so I pull in. Darn, nothing but regular grade here, too. I’d just crossed over U.S. Highway 34. The sign said McCook, Nebraska was within my fuel range if I was careful. My bike tells me how many miles of fuel I’ve got left, based on how much I’ve been using. The bike says I can make McCook. I’m hoping the bike is right, because I thought Imperial was remote, at least they have streets. Benkelman is a third the size. So, I get on Hwy 34 heading east toward McCook, which will also take me home. Highway 34 is a former major east west highway that travels along the southern part of Nebraska. It connects Lincoln with Denver. This road has truck traffic and more. Even though I’m in pretty remote country, I don’t feel so remote. I was on a State Highway, this is Federal. The hilly terrain lends itself to reservoirs used for flood control, irrigation and recreation. It’s starting to look less desolate. I travel through some very interesting small towns. The business districts are off the highway. This was probably the first major change in transportation, routing major highways around towns. The very early days of cross country travel didn’t have much for roads. The roads meandered all over to avoid geographic obstacles, such as tall hills or stream crossings. They also might have passed the County Commissioner’s house. Construction of major paved highways straightened the roads and took them out of the little towns proper and moved them around for safety. I’m totally enjoying this part of the trip. The scenery is interesting, the little towns take me back to days gone by and the miles seem to fly along. Oh, Holy Mother, there is a God and she just helped me find a gas station that has 91 octane, the real deal, fresh gasoline. Wow, and the pumps even take credit cards. I am saved. I filled her up and exhaled a sigh of relief. By coincidence, maybe not, the sign at this intersection told me that Atwood was within an hour down another road. I smiled. Back on Hwy 34, I continued east. Soon, I was taken back 50 years. When highway 34 was a real artery of transportation, before Eisenhower decreed the construction of the Interstate Highway system, you could tell you were nearing a town because you started seeing all manner of small signs. First, the sign for the Catholic Church, then the sign for a funeral home, then Louie’s Hardware and Red’s Barbeque. Like a string of beacons, the signs alerted motorists to an upcoming town and pointed the way. The only thing missing were the “Burma Shave” signs. They were a fun string of rhyming signs. The Burma Shave signs were all over the place and were both entertaining and provided a nice lesson. Everybody knew Burma Shave. Oh, boy. The bike was full, but I was hungry. I was looking for a good place to eat. This was another adventure that I relished, looking for a biker bar or café. I never eat fast food. It’s not good for you, it’s not flavorful and it’s just no fun. Half the adventure is finding great local places to eat. I cruised down Main Street, but didn’t see anything. I did spot some interesting places off on side roads. The terrain here is extremely hilly. Parking a car on a hill is no big deal, but parking a big bike can be a serious challenge. First off, every road is crowned, so rain water can run off. This means every parking place is downhill into the curb. Pull straight into one of those and you’ll never push a large bike back uphill out of it. The bike has to be carefully backed in. Fire that mother up and head out when you’re done. The problem is due to angle parking being at the wrong way for backing into it. It requires several forward and rearward movements. On the side of a steep hill, not so easy for a chick to maneuver a 1,000 pound Electra Glide. That out of the way, I used the one in back. I asked what they had on tap and she said the taps were out of CO2, but they had bottled beer. I didn’t think anything of it at the time, although I’ve never been into any bar that was “out of draft beer”. I ordered a burger and we had a nice conversation. Life in a small town can be challenging, particularly for women. She was very nice and we related well. In fact, we seemed to talk at length. Like a lot of young people, she was trying to establish a positive life direction and I worked to help her with some words of encouragement. Soon, another woman came out of the back with a handful of bills and told her she needed to go to the bank right now. She excused herself and told me she’d be back soon. I’ve owned a small business for many years and suddenly, the lights came on in my head. There wasn’t that much money. It was meal time, the place was empty and they were out of CO2. A bottle of CO2 can’t cost all that much and for a bar to be out was a serious deal. She had to go to the bank right now. I wished her the best as she left. Funny thing, I’d been carrying a gold colored coin, good for a dollar, for quite some time. It’s a regular U.S. coin that was intended to replace the paper dollar. These didn’t catch on because there’s no place for them in a cash register. As I left, I called over another woman and gave her that coin. I said it was for the first girl. Tell her it’s a good luck piece that I brought for her. I hope it gets to her and I hope it provides some inspiration and good luck. I laid a good sized tip on the bar. I got on my bike, thanked my own incredible luck and my wonderful life and headed for home. I’m very sympathetic to working people. I have vivid memories of those times in my own life long ago, where I couldn’t afford to go to the laundromat (that’s a washateria for those in Texas) to do laundry. I had to wash my clothes in the sink and I was all too familiar with ramen noodles. The rest of the ride home was enjoyable and the songs seemed to click by in about 3 seconds each, just like the miles. My two day total was 700 miles, 260 the first day and 440 the second. I’m slowly getting over my severe case of PMS (Parked Motorcycle Syndrome). WARNING: Prolonged exposure to a parked motorcycle may have severe and persistent symptoms. For best results: Ride often and share your joy with others. Bugs are an excellent source of protein.